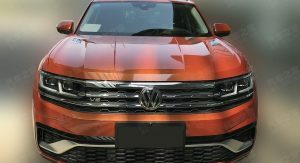 The crossover coupe craze is spreading to mainstream automakers as Volkswagen will unveil the Teramont Coupe at the Shanghai Auto Show next week. 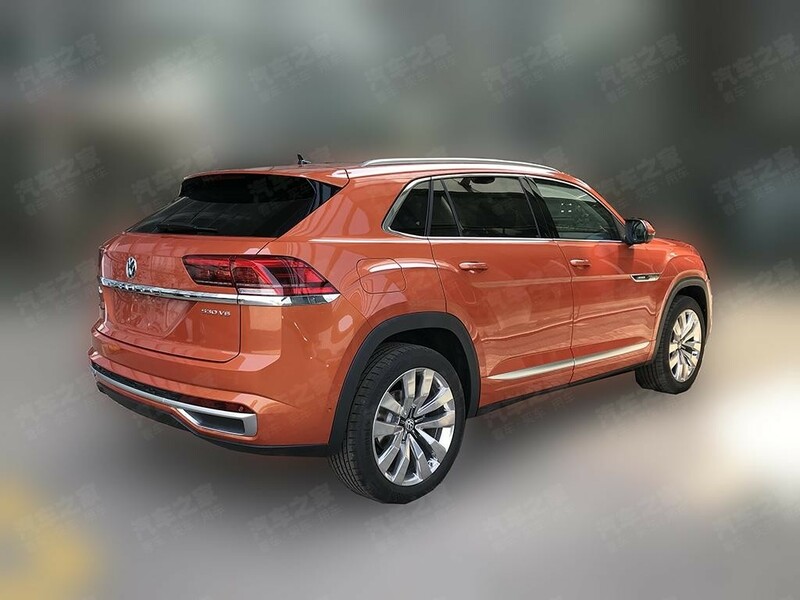 Previewed by last year’s Atlas Cross Sport concept, the production model was recently spied undisguised in China. It echoes the original show car and is instantly recognizable as an Atlas / Teramont. Despite the styling similarities, the Teramont Coupe has a slightly revised grille that now extends beneath the slimmer headlights. Designers also installed a sportier front bumper which features a black surround, honeycomb mesh inserts and a stylish chrome accent. The squared off fender flares carryover from the standard model, but the coupe has a more steeply sloping roof and unique rear doors. The crossover has also been equipped front fender vents, painted side skirts and a sportier rear pillar. The tailgate is also brand new as it has steeply raked rear window and a unique spoiler. 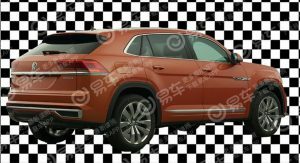 We can also see new taillights, wraparound chrome trim and a sportier rear bumper. Unsurprisingly, the interior largely carries over. 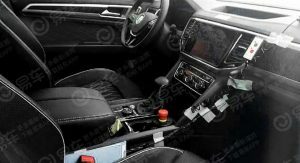 However, the coupe has a new flat-bottomed steering wheel, revised trim and stainless steel pedals. 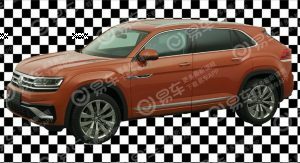 While the model shown here is the Chinese-spec Teramont Coupe, the US-spec crossover should be nearly identical. 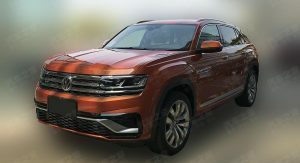 Volkswagen has already confirmed it will be launched later this year and built alongside the standard Atlas in Chattanooga, Tennessee. 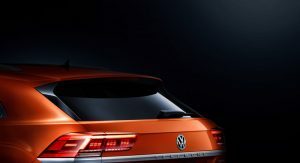 Volkswagen hasn’t said much about the model, but the concept measured 190.8 inches (4846 mm) long, 79.9 inches (2029 mm) wide and 68.3 inches (1735 mm) tall. This means the coupe was 7.5 inches (190.5 mm) shorter than the standard Atlas, despite sharing the same wheelbase. 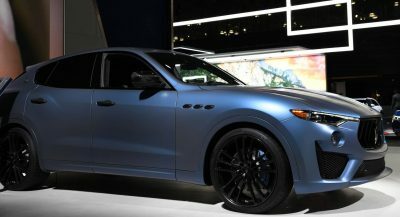 Engine options should carry over and US customers can expect an entry-level model with a turbocharged 2.0-liter four-cylinder that produces 235 hp (175 kW / 238 PS) and 258 lb-ft (349 Nm) of torque. This should also be a 3.6-liter V6 developing 276 hp (206 kW / 280 PS) and 266 lb-ft (360 Nm) of torque. Exactly WHY is this needed? Answer: it’s those crazy Germans creating niches again, that nobody wants. They made a concept and asked people if they wanted it. People say yes, so they built it. If anyone is to blame (for better or for worse) it would be the customers who wanted this. I wish they would have stuck to the concept, which would not have been difficult to produce. It looks okay in white with big rims. One thing that I don’t want is fake exhaust tips dang it!! 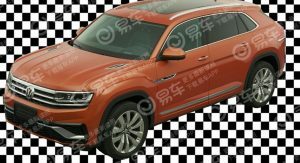 The midsize SUV segment in the US is enormous, and SUV sales are growing in China, and VW wants a piece of both of those markets. See my reply to your post above. I like it! There are people out there who want that style of car and can’t afford or simply don’t want to spend that much on a GLE/X6 etc. 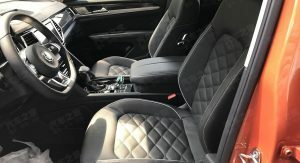 The interior looks more upscale than the one in the North American Atlas. 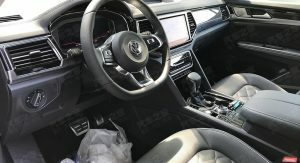 The screen is larger and has no buttons, the climate controls and swtichgear around the gear selector are different too. 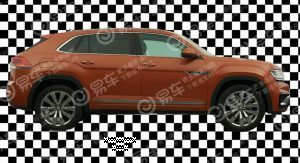 In my opinion the most coupe-ish looking suv from the side profile is X6. But still, if other car companies would like to create good, sporty looking suv with poper proportions, they should take a look at Velar. exactly how is this a coupe? bulky, lacking finesse, elegance and personality, definitely. But a coupe? 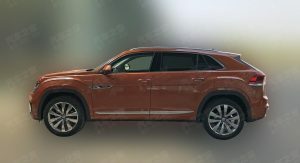 Those Marketing People Need to stop selling ugly four door SUVs as a Coupé. And this monstrosity is cherry on top. Just as underwhelming as I expected it to be. Sad. 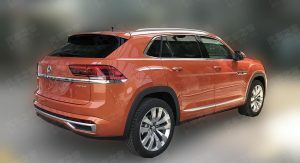 I get that the Touareg is a little expensive for the US market, but at least it’s a vehicle that does the brand proud. The only such vehicle currently in the US lineup is the Golf/GTI/R. Everything else sold here should be wearing a Skoda badge. Saying that US market Volkswagens should be wearing a Skoda badge is an unforgivable insult to Skoda. Most of their cars are far better than the decontented trash Volkswagen seems content to foist on Americans. Maybe, but Americans don’t know that. There have been exceptions, but as a rule VW’s have historically been classified as premium mainstream. Now they’re just cheap, unimaginative lumps priced like much better vehicles. They’ve damaged what little reputation they had. They’re cheap, unimaginative lumps because that’s what Americans seem to want. It wasn’t that long ago that a broadly similar range of cars were offered in Europe and the United States, and you turned your collective noses up at them because they were ‘too expensive’. Basically, you get what you’re willing to pay for. And Edge, and Santa Fe, and Pilot, and Grand Cherokee, and Outback, and Murano. The 4-door, 5-seat midsize segment is getting really hot. Who says this is a 5-seater? I’d guess it is, considering the shorter length, but the article says nothing about passenger capacity. I just saw a Chevy Blazer RS in person and it looks damn good. Wish they would put a turbo V6 in there. 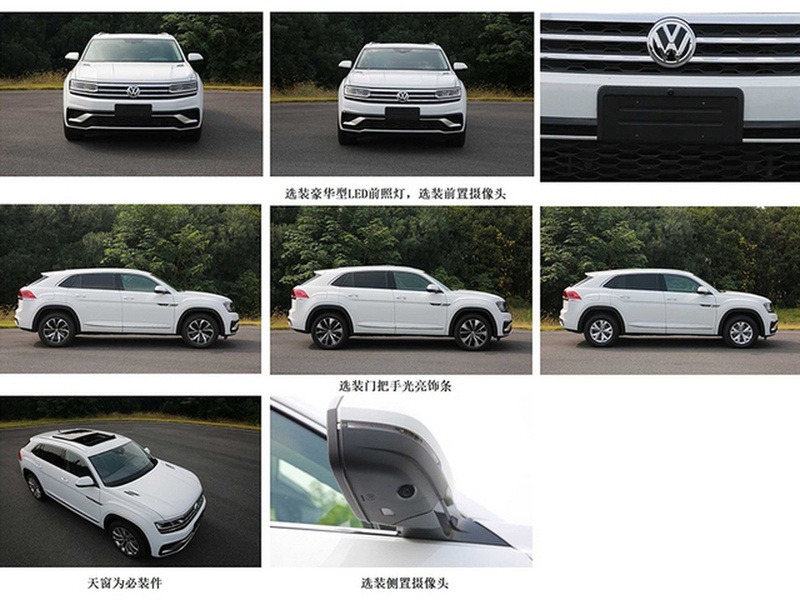 From B-Pillar rearward, looks like a locomotive train. Makes the M-B GLE Coupe look like a Mona Lisa. 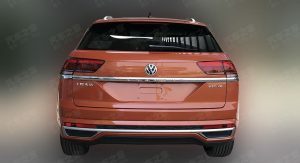 This is a significant downgrade from the production-ready-looking concept VW presented previously. And what’s with the interior in pics 7 and 8, which also look worse than the interior in the Atlas. Probably the most slab-sided side profile I’ve seen since the Dodge Nitro. I hate the rising belt-line, it must feel like looking out of an Evoque, especially for second-row passengers. Not the worse thing in the world by any means, but I look at it and I feel a lot of potential and opportunities was squandered with this vehicle. 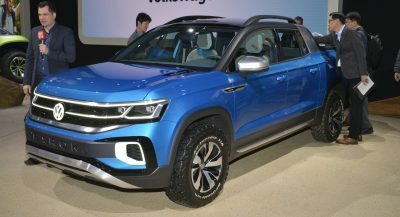 If anything, the look of this vehicle is an expression of how VW views the American and Chinese markets. Volkswagen’s most irrelevant new model yet. Pretty sure SUV coupes have a target audience that is very different to that of family CUVs.